The Akiles Pro-Lam Ultra is the latest addition to the Akiles ProLam Heavy Duty Laminator Series, possessing superior quality and functionality combined with commercial grade design. The ProLam Ultra features a large LCD display and keypad, making it extremely easy to use, and includes seven preset memory settings ensuring you have the correct temperature and speed for different pouch settings. The large 13" throat allows the Pro-Lam Ultra to laminate a wide array of pouch sizes, up to 14 mil. The patented internal air cooling system keeps the laminator cool to the touch, even during extended use. With four heated rollers and two cold rollers, you can achieve a more professional, crystal-clear and bubble-free lamination finish. Along with a reverse function and easy to open cover for direct access to the rollers, you can be assured that the Pro-Lam Ultra offers the ultimate in user-friendly features and professional results for all of your pouch laminating projects. User friendly Control Panel with large LCD display and many memory settings and features makes it a very easy-to-use laminator. Air-Cooling System keeps the laminator cool to the touch while in use. Auto Shutoff automatically cools and shuts down the machine, prolonging the life of your laminator. 7 Memory Settings ensure you have the correct temperature and speed for different pouch thicknesses. Removable Cover allows direct access to the rollers and requires no tools to remove. Welcome to MyBinding video. 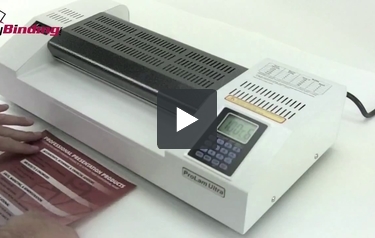 This video looks at the ProLam Ultra, a brand new 13 inch pouch laminator by Akiles. The ProLam Ultra is a heavy duty, fast acting laminator. Let’s watch it in action step-by-step. Everything is controlled by the LCD panel on the right hand side, including temperature, speed, as well as memorizing settings for future repeated action. Use the very helpful graph printed on the top of the machine to make the best temperature and speed selection for your size thickness of pouch. For this 3mil project, we’re doing 100 degrees in temperature and six for the speed. Having placed our material inside the laminating pouch, make sure the crease always goes into the throat of the machine first. And the Akiles ProLam Ultra takes over from here. The wait time depends upon the speed that you have selected. However, none of it is very long. Even though there are built-in fans, it’s always best to lay your finished project down to cool. The 13 inch throat opening on the ProLam Ultra allows you to do oversize documents, or in this case, two documents side by side in an extra large pouch. Simply line them up, close the pouch, and feed it crease first into the throat of the machine. If you need to, you can change the speed during the middle of the project. And always wait for your project to be completely finished and out the back before you remove it. If you’re working with a thicker pouch, for instance this one is a 5mil, we simply read the chart at the top, changed our settings, both the speed as well as the temperature, to the proper setting. Got our new materials ready, put the items in their pouch, waited for ready to show up on the screen, and sent them through. It really is that simple with the ProLam Ultra by Akiles. Be sure to always shut down and turn off your machine, letting it cool before you store it away. For more demos and reviews of this product and many more, check out MyBinding.com. Welcome to MyBinding video. This is a quick video comparing the different ProLam Ultras by Achilles. Let's take a look at the Ultra X10, the XL, and the X6. Of primary concern are the number of rollers. The X10 has 10 rollers, 6 Hot, 4 Cold, and the XL and X6 both have 6 rollers, 4 for Hot and 2 for Cold. In terms of throat opening, therefore the size of pouch you can use, the X10 and X6 both have a 13" throat. The XL has an 18.9" wide throat. The number of rollers and size of motor equals speed. The X10 can blaze at 142" per minute, the XL travels up to 47" per minute, and the X6, 59" per minute. And finally, when it comes to pouch thickness, all three machines have a max pouch thickness of 14 mil or 350 microns. All three are excellent hot and cold laminating machines will serve you well. Give us a call if you have any questions. For more demos, reviews, and how-to's, check out MyBinding.com. Transcript: Welcome to MyBinding video. This is a product review of the ProLam Ultra, a brand new 13 inch pouch laminator by Akiles. The ProLam Ultra has a lot to offer and does a professional and very fast job with pouch laminating. Let's watch it in action step-by-step and check out its features. Welcome to MyBinding video. This is a product review of the ProLam Ultra, a brand new 13 inch pouch laminator by Akiles. The ProLam Ultra has a lot to offer and does a professional and very fast job with pouch laminating. Let's watch it in action step-by-step and check out its features. In short, you take all the quality and workmanship of the entire ProLam line by Akiles and wrap it up into one machine and you have the ProLam Ultra. This machine uses six rollers to do its work, so it's incredibly consistent. The LCD control panel on the right hand side controls everything and we love it. It's hot and cold lamination temperature settings, speed settings, everything. It also can memorize settings for quick reference and repeated action later on. Printed on the top of the machine is a very handy chart that will assist you in choosing what temperature and speed is best for your pouch thickness. And because you can change the settings, lamination speed varies from 12 inches to 59 inches per minute. What you see here is speed six. ProLam Ultra has a 13 inch wide throat opening, which means it can handle the largest of laminating pouches. So posters, oversized projects, double sheets, anything can be done on the ProLam Ultra. And pouch thickness isn't a problem either because it can handle from 3 to 10mil in thickness. However, the thicker the pouch, the slower the processing speed, as it simply needs more time on the heat rollers. But hot or cold, this machine can do it all. Should you need to, you can reverse the rollers. There's a button on the bottom right corner of the control panel. Simply press it, hold it, and the machine will back up everything; you can remove or recenter as needed. Once you tell the machine to cool down, it does so on it's own and automatically shuts off. We like that. Overall, we really enjoyed this brand new offering by Akiles. The ProLam Ultra will run you well under $600. This can certainly seem pricey; however it really has no limitations and if you have a lot of laminating to do, the ProLam Ultra will be hard to beat and you'll be pleased with the results. For more demos and reviews of this product and many more, check out MyBinding.com. The Pro-Lam Ultra has a 13-inch feed opening so it's capable of laminating both large and small documents. You can use this device to laminate just about anything including signs, brochures, and small posters. This machine is compatible with laminating pouches that are up to 14 mil thick, so you'll be able to give your materials the protection they need. The laminator has 7 memory slots so you can program in various settings for different pouch thicknesses. The Pro-Lam Ultra can make any document look great because it has 6 silicone rollers. Four of these rollers are heated and the other two are cold so everything you laminate will be free of heat marks, bubbles, and wrinkles. Also, this machine has a cold lamination setting so you can easily process heat-sensitive items like photographs. You'll find that the Pro-Lam Ultra is very easy to use. It has 9 speed settings as well as a user-friendly keypad and digital display. There's even a handy chart on top of the machine that you can use to figure out which settings you should use. The device also has a reverse mode which will be helpful in the event of a pouch jam. Also, the machine will remain cool to the touch during operation since it has an air cooling system. The Pro-Lam Ultra can laminate up to 53" of material in a single minute. Thus, you'll be able to quickly laminate your documents so you can move on to other tasks. Maintaining this device is easy because you can remove the cover without any tools. Once you remove the cover, you can clean the rollers or do any other needed maintenance. 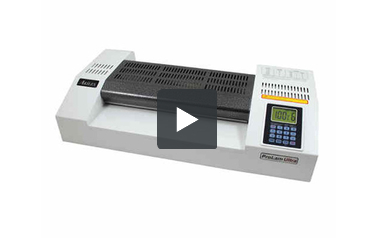 The Pro-Lam Ultra is one of the most durable pouch laminators available. It features all-metal construction and an industrial-strength motor so you'll be able to get a lot of use out of it over throughout the years. Finally, this machine's warranty lasts for 1 year. Final rating: 9. We were very, very impressed by the Akiles Pro-Lam Ultra and feel that it's simply one of the best pouch laminators available. This is a heavy-duty machine that's very durable but still easy to use. Best of all, it produces beautifully laminated documents so you can be confident that your materials are going to look great. The only qualm we had about this machine is that it's a bit on the large side. Thus, it might not be the best choice for really small work areas. But if space isn't an issue for you and you need a professional-grade laminator, the Pro-Lam Ultra is an excellent choice. Check it out today. What is the difference between this model(Pro-Lam Ultra Six Roller Photo) and the Prolam Ultra x6? They look the same to me. Thank you for your question. 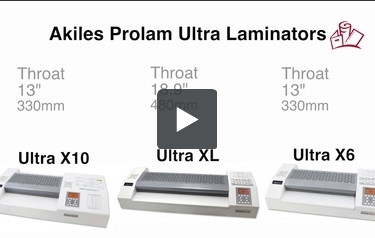 The Akiles Pro-Lam Ultra Six Roller Photo Laminator process the film at a slightly slower rate. It can run at up to 53" per minute where the Akiles Prolam Ultra X6 Laminator tops out at 59" per minute. They are very similar machine the x6 is designed to work in a slightly higher volume environment.